No insult is intended to Pigs (or MiGs for that matter), but the old saying "When Pig's Fly" is intended to invoke an image of absurdity. The German version, "Wenn Schweine fliegen könnten!"... is essentially identical, while the Russian version "когда рак на горе свистнет"... "when the crawfish whistles on the mountain" uses a different image for the same result. Unfortunately, during the last year, two of our Cold War Air Museum adventurers had the misfortune of taking a fall (from a ladder and a wing) while working on the MiGs. Needless to say, such excursions from controlled airspace brought about a serious response from the Museum Safety Officer (in his case, after he recovered) as well as cautions from others at the Museum (not to mention those at home). Therein lies the MiG tie-in for this post. "Certainly pigs can fly, it is simply a matter of applying sufficient thrust. The problems lie with the lack of effective flight controls, landing systems and waste containment. For these reasons, pig flight over populated areas is not recommended. Regardless of such musings, we do emphasize safety and we considered creating an emblem or badge for that purpose. 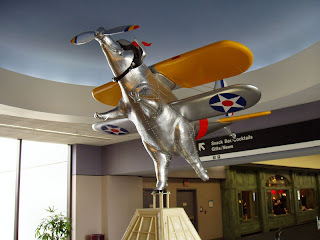 The statue above is located at the Cincinnati airport. In the 1800's, Cincinnati was the hog processing center of the U.S., As pigs arrived in railroad cars for the slaughterhouse, it was said that they were packed so tightly they would "fly" out of the cars when the doors were opened. Cincinnati thus became know as the "City of Flying Pigs", perhaps a better moniker than its other nickname of the time, "Porkopolis".